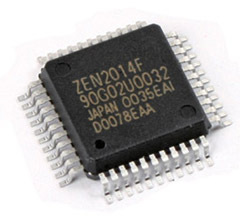 ZEN2014F is a 24 bit ultra high speed programmable universal counter IC. It can count 2 phase pulse signals and up / down pulse signals output from rotary encoders, linear scale etc. Compared to the conventional ZEN2011P, the counter response speed has been increased to 4 times that of 33 MHzmax, and the QFP 44 pin package was adopted to further reduce the size. It is also compatible with ZEN2011P on software. It is high speed and miniaturized by the latest manufacturing process, and the price has been reduced to about 1/2 of that of conventional products.